Controversial Nigerian cross dresser, Idris Okuneye a.k.a Bobrisky, has set the internet on fire again as his peen comes through for him in new photo. 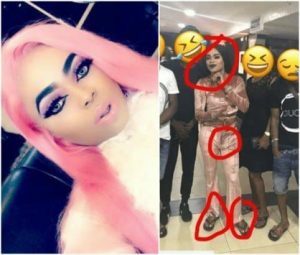 Bobrisky whose intention was to share a picture on instagram ended up sparking alot of controversy on his instagram page as he showed off more than what he had hoped to share.In the picture, one can see the difference in the complexion of his face and his feeet including the little ‘bulge’,down there. Recall that Senior Advocate of Nigeria (SAN), Festus Keyamo in 2017 said Bobrisky can not go to jail for admitting that he is an homosexual except caught in the act. Bobrisky was reported to have been arrested by the Lagos State Police Command at Lekki, after he allegedly admitted that he was gay in a post which was reportedly deleted. For me, you have to be caught in the act,” he said. Wow, imagine, this bobrisky man is so funny, that's how he always waste huge money on internet. Anyways I thinks it's still normal sha.